Can you really mix 5 cups of herbs and vegetables into less than three cups of cooked rice? Yep. This simple, flavorful recipe is a great way for those who aren't big on munching giant salads to get a big serving of fresh greens. To turn this into a vegetarian main course, just stir in some chopped fresh tomatoes, crumbled feta cheese, and garbanzo beans, then wrap it all up in flour tortillas if desired. Once you realize that almost anything can be stirred into hot rice, you can let your imagination run wild. I've added everything from caramelized onions, sautéed mushrooms, and cooked ground lamb to this basic recipe. Other ideas: a handful of your favorite fresh herbs, shredded carrots or finely chopped broccoli, some cooked lentils, chopped nuts, leftover chicken or roasted vegetables. If you can't find RiceSelect Royal Blend rices locally, they are available on Amazon.com. 1. Combine the rice, water, salt, and butter in a medium saucepan. Bring to a boil; stir once. Cover with a tight fitting lid, reduce heat, and simmer for 15 minutes. 2. Chop the vegetables while the rice is cooking. 3. When the rice is done simmering, turn off the burner and let the rice sit, covered, on the warm burner for 10 minutes while you make the dressing. 4. Place the olive oil, lemon juice, garlic, salt, and pepper in a glass measuring cup or small bowl and mix with a fork until well combined. Or you can make the dressing ahead of time and keep it in the refrigerator; bring to room temperature and mix well before using. 5. Stir the greens, parsley, scallions, and red pepper into the rice. It will look like you just added way too many vegetables, but they'll soften and shrink down in the hot rice. Add the dressing and stir until well combined. 6. Replace the lid on the pot and let sit for a few minutes. 7. Stir, taste and adjust seasonings if needed, and reheat lightly if desired. Serve warm or at room temperature, either as is or with tomatoes, garbanzo beans, and/or crumbled feta mixed in. Keeps in the refrigerator for up to two days. You can either mix everything up together and then fold it into a tortilla, or layer the rice mixture and other ingredients. For 1 cup cooked rice I used 1/4 cup garbanzo beans, 1 large plum tomato (about 1/3 cup diced), and 2 Tablespoons feta cheese. © FarmgirlFare.com, the vegetable happy foodie farm blog where Farmgirl Susan shares recipes, stories, and photos from her crazy country life on 240 remote Missouri acres—and the sheep and donkeys aren't the only ones who love their greens. This recipe looks so yummy; I think I'll make it today! Just cleaned out much of my garden yesterday, and have revived kale and volunteer Swiss chard, fresh-picked carrots and bell pepper, and tomatoes and parsley still available. mmcmillen AT macnet DOT com. I know a girl's gotta make some money...but I hate it when bloggers shill. :( When a brand is all about honest, tales of life in the country, it's always sad for readers to feel like they're just 'for sale'. Every article 'written for hire' feels like a violation of (implied) trust. Exactly why the advertisers exploit it. Just my opinion. Thanks for listening. A Marketing Exec who knoweth of what she speaketh. I'm sorry you feel that way. I believe I responded to a similar comment you made back in 2012: http://www.farmgirlfare.com/2012/06/monday-dose-of-cute-anyone-for-apple.html. I have been working extremely hard creating TOTALLY FREE blog content for readers around the world for over 8 years. When my publishing network, BlogHer (which helps over 3,500 mostly women bloggers earn an income from their hard work) asks me if I'd like to create an ORIGINAL RECIPE for a product I like and believe in, and yes, they're going to pay me for my time, I say yes. And then, as always, I put 110% into my job, creating a unique, entertaining blog post that no one is required to read. Basically everyone who gets paid for doing any job is "for sale." Well, thanks for posting it. Blogs, all social media really, are intended to be dialogues (hence the comments sections), and in any 'conversation, not all thoughts will be in total agreement. One just hopes that there is some thought and respect put into all comments (and posts) so as to foster real communication and not just impulse 'flaming'. Susan, as you also know, I've posted many supportive and quite complimentary comments to your blog, alll of which I meant. Indeed, I enjoy reading it very much. I love the unfiltered, genuine insights provided by bloggers who let us see into their world, experience a lifestyle not available to us where we live, etc. As social media becomes more and more commercial --and from the perspective of an Advertising Director for many years, and later, a Chief Marketing Officer-- we run the risk of these "advertorials", sponsored (and influenced by implication) posts diluting exactly what we love most about the medium. Your brand, to this reader, is an intelligent, pragmatic, perspective into a animal filled, weather buffeted, hard working life and I enjoy it very much. My original post was written with care, intended to highlight the 'compromise' to your brand that writing/reviewing products for hire brings-- it is exactly why advertisers seek you, and others like you, out. Your testimonial to their products helps them sell. It's a marketing strategy I've employed myself as an advertiser. However, it is a development to personal blogs that makes me sad. Unlike the more commercial blogs, or tweeting-for-hire, or other forms of overtly commercial social media, I so want personal blogs to remain unadulterated, a pure recount of a life far from mine. And so I voice that opinion, and try to state why, respectfully. I can only imagine that farming is a tough life financially. I get it. Some bloggers, using their blogs for income as well, state very overtly that they are being paid to write about a product (and of course the post will be positive or they'd never be asked to do it again, right?). I'd love for blogs to be straightforward folk-literature. But if they can't, perhaps a more forthright mention of motive would help preserve the very trustworthy nature of your personal brand. And that, dear writer, was the point I was trying to make. Thanks for listening and for keeping the dialogue open. Well, I disagree vehemently, Tracy. I think Farmgirl Susan's RELATIVELY FEW sponsored blog posts are carefully chosen and of a very thoughtful nature. She created a (what appears to be quite delicious) recipe specifically for a product that she uses and likes, and she shared it with us. Exactly how is that different or "inauthentic" from what she normally does? Not to mention that Farmgirl Susan was quite transparent that this was a sponsored post. You are completely out of line to demand "a more forthright mention of motive." Her "motive" is absolutely none of your business, Tracy. Listen, she's not shilling Doritos. She's not going all Sandra Lee and using convenience mixes. And if she got some compensation for creating this recipe, what's it to YOU? We all enjoy her recipes FOR FREE ALL THE TIME. Why shouldn't she occasionally get compensated for them? I think you need to take your yearnings for "folk literature" and start your own blog. And do please proceed to tell us all about your career marketing goods to consumers. Do tell us all about how forthright you were in representing brands--regardless of your connection to them--FOR PAY. Tell us all about the "genuine, unfiltered insights" you used to make brands appear trustworthy. It should make for some excellent reading. I mean, you know--as a pure recount of a life far from the rest of ours, and all that. And to think that a former Chief Marketing Officer actually has the chutzpah to chide a food/farm blogger for a sponsored post. That, folks, is what some of us refer to as unmitigated effrontery. Because I am hoping to have my voice heard here, I am not even going to enter the giveaway. But I will continue to buy RiceSelect products and intend to make and thoroughly enjoy the recipe Susan so generously concocted for our enjoyment. As a marketing exec you have, no doubt, participated in wrapping something as nutritionally toxic as pop tarts in a ‘lifestyle’ to which people should aspire. The audacity of you criticizing Susan for creating a recipe that uses a rice mix is appalling to me. That you, who have most likely made a significant amount of money pushing products of dubious usefulness or even safety, would dare to find fault in this post is absurdly hypocritical! Why don’t you start your own blog and provide unfiltered insight to the life of an advertising exec where you let everyone know the ins and outs of deceiving the public? In doing so I’d be very interested in whether you would post any of the negative comments you would receive. No, more likely you would filter out anything that didn’t support your view of the world. Evidently it’s ok for you to earn excessive amounts of money hawking products you most likely don’t believe in nor use but woe be tide that an average hardworking blogger earns a few dollars for creating a recipe. So it’s ok for you to do this but not for Susan? How does this recipe alter the authenticity of this blog? I for one appreciate her opinion on products because unlike big marketing execs such as you, she actually used the product. How many of the products you hawked over the years did you actually use? No, your original post was written as a whiny temper tantrum from someone who just realized that just like you bloggers have bills to pay and from time to time will earn money from their blogging endeavors. You’re like the child upset when they are told by an older sibling that Santa isn’t real. Your idyllic view of bloggers pouring out their heart just for the sheer enjoyment of strangers has been cracked so you lash out just as the child lashes out at their sibling about the lack of Santa’s existence. I’ve been reading this blog for a couple of years now and only commented one other time on one of the dog photos (which I love) but your pompous self centered comment could not go unanswered. Your contention that Susan was not forthright in this being a paid recipe is equally off base as the rest of your issues. Perhaps you should go back and read the first paragraph where she states quite clearly that she was commissioned to develop a recipe. Love the Jasmati. Susan, your rice salad was fabulous and you can "shill" at me anytime you want! I'm so sorry you were hurt by Tracy's comments - I'm even sorrier she couldn't find it in her heart to actually apologize for the comment. I'm sure she makes a great living shilling the public. Zora beautifully said everything I was feeling after reading all this, so I won't ad to it. Thanks for your blog and your recipes - they are all great. Tracy, Susan is far kinder to you than you deserve, but I have no diplomatic dog in this fight so do not have to be. To be blunt, hypocrites like you make me sick. You freely admit how much enjoyment and happiness this blog gives you; you benefit from the obviously incredible amounts of effort Susan puts into it on top of all the other work she and Joe have to do to care for the farm, the animals and oh yeah, themselves, and yet, despite her amazing generosity in sharing all of it with us, you choose to cavil at the incredibly rare sponsored post that somehow disturbs your vision of Farmgirl Fare as something entirely detached from the economic reality of what it takes to keep that farm - and by extension, the blog you claim to enjoy so much - going. That you could stand on your soapbox denouncing Susan for doing what YOU FREELY CHOSE TO DO FOR A LIVING - and for which you probably got paid a h*ll of a lot more money than she will ever see from these small sponsored listings - is truly nauseating, and you should be utterly ashamed of yourself. Rather than stick your negativity into the mix whenever there is a remunerated post for certain product, why don't you just delete it and QUIETLY wait for the next dose of sweet Jasper, the pups, magic donkeys and rest of the gang? I would also like to point out that many of these sponsored posts benefit FF's readers, such as the $100 gift card offered as part of this post. You have no idea what financial circumstances some of those readers might be in, in which a gift card or other prize might be very welcome indeed. But no, your narcissism and disdain would block any such charitable thoughts - you obviously don't need such things, so why should anyone else, right? For God's sake, take off those stupid rose-colored glasses and take a basic astronomy course so you can learn that the world does not, as you seem to think it does, actually revolve around you. I would like to try the Royal Blend Whole Grain with Texmati Brown & Wild Rice. Susan! We adore Texmati rice. After leaving the grocery mecca that is Southern California and Trader Joe's on every street corner, I'm bereft without my Trader Joe's brown basmati rice, the only rice I can make successfully. Now living in the hinterlands of New England and 1.5 hours from the closest TJs, we've discovered the beauty of Texmati, which is grocery store available! I've used only the brown basmati, but now will explore the blends which sound fabulous, thanks to you! Am running out now to pick kales, leeks, parsley, peppers, tomatoes, and garlic already harvested. You've never posted a recipe we have not loved, and this one looks over the top, fabulous. Thanks for pointing out the grain blends of Texmati. Will delight in exploring them! Thanks so much to you!!! Susan, your recipe sounds great, as always! I would love to try any of the RiceSelect blends. @Tracy, if you don't like it, don't read it. No need to be nasty. Seriously. The RiceSelect NORTHERN ATLANTIC Blend looks great! Love them all! Anything with fresh veggies and maybe a cut up apple as part of a rice salad would be fine with me! I'd like to try the Royal Blend® with Brown, Red, & Wild Rice. Aaand now I am hungry. Brown, Red & Wild for me. mac1572 at gmail dot com. Thanks for the recipe! I love the Texmati and Jasmati...but would really like to try the Arborio! I've had the Texmati before, but this Royal blend sounds good. I love rice, can't wait to try this recipe. I love RiceSelect products and always have their Arborio Rice and Whole Wheat Pearl Couscous in the cupboard. Last night I made a delicious mushroom risotto with Chanterelle mushroom (whohoo!!) that I found at a local farm stand on Sunday. (Love this time of year in New England.) I'll look for the Brown, Red, & Wild Rice blend in my supermarket. Sounds like it might be a new favorite! I'd love to try Royal Blend® with Quinoa! Thanks for the giveaway! This recipe looks delish! Just my style, lots of veggies. Definitely going to try it. I think the Royal blend looks fabulous. I love rice. I'll have to look for this kind of rice at my store. I use a rice cooker though. Love rice and rice blends and adding 'stuff' to them! What a nice recipe, thanks! No pasta or bread in our house means a LOT of rice and potatoes. Rice skillet meals are a fall-back for anything I have around. Rice+vegetables+meat (sausage, ground beef, ground lamb) stirred around in a skillet with cheese=dinner. I'd love to try the Rice Select Royal Blend, Whole Grain Texmati Brown & Wild Rice with Soft Wheat & Rye Berries. And topped with beans! I've never tried this brand, but it looks tasty! The blend with quinoa looks intriguing. And yummy recipe! The Royal Blend is really wonderful in Pilaf, but we love all the ones we've tried so far. I think the greek one seems really yummy! Oooh, I think I'll have to pick up some of the Royal Blend Texmati Light Brown rice with Flaxseed. I love me some Omega fatty acids. I love to make my rice with black beans. Or some veggies mixed in (not as many as your recipe, so I'm going to have to look into that one!). Thanks! Here's the thing---we love this blog and we love you Farmgirl Susan! Every recipe of yours I have ever tried has been great---the recipes are obviously well tested and that makes a big difference for us when we try to follow them---you give us helpful tips and ideas for variety. Yes, we might try a product because you write about it because we know you and know that you would only write about something that you actually like--- I am not a big rice lover but you inspire me to want to try these. What's wrong with that :)! I wish we (your fans) could come up with more ways for you to bring income to the farm. We'll think about it! Thanks for the another tempting recipe. RiceSelect Royal Blend with Red Quinoa! I'd love to try Royal Blend Texmati Light Brown Rice with Quinoa. I like adding chicken, veggies and Italian dressing to my rice with some cheese on the top! I got here by following a pin for your Green Tomato Relish that I'm all set to cook up tomorrow with our leftover green tomatoes, various peppers and just-harvesting Fuji apples. This rice salad recipe caught my eye because I'm working on curing my Diabetes with a greens, beans and whole grain diet. I would love to try Royal Blend Texmati Light Brown Rice with Quinoa. I nutty brown rice but it takes so long to cook. This product sounds ideal. My contact is greensing2 at mstar dot net. Thanks! I would like to try RiceSelect Royal Blend. I would like to try the ROYAL BLEND TEXMATI WHITE, BROWN & RED. It sounds really good. Texmati with Quinoa sounds good. Wow. I love rice blends. I want to try that texmati blend that you used and I want TO MAKE THIS RECIPE! And Susan I am one of your biggest fans. Thank you so much for all you share with us! I'd try the Royal Blend® with Quinoa to get extra protein. This recipe looks great. Thanks for the opportunity. I love to turn rice into a breakfast pudding of sorts with a granola-esque topping. Well...I discovered your blog while looking for beer bread. Since then, I've been making recipes from your index and everything I touch is scrumptious. Then I stumbled upon this post. Awesome!!! Looking forward to trying out this recipe!!! The Texmati with flaxseed sounds wonderful! Recently had a mix with couscous and tiny lentils and it was so, so good. I would love to try the couscous! Your blog is awesome! I would love to try the Royal Blend® with Brown, Red, & Wild Rice. I'd definitely like to try one of the whole grain blends. I would love to try the Texmati with Quinoa. I will have to look for it next time I am shopping. And your recipe looks delicious! As a type 2 diabetic, rice and other carbs have no place in my own diet, but the rest of my family loves it. I like to prepare it for them because it's easy and works well as leftovers to be reheated in the microwave. Texmati with white, brown, & red looks fun! I'd love to try the Royal Blend with Texmati White, Brown & Red Rice. Oh my, I have found quinoa this year, and it is my new favorite addition to salads. I'd like to try the Texmati with Quinoa, Texmati Light Brown, Red Quinoa, and Freekeh. The Royal Blend, with the brown, red, and wild rice. Sounds like the perfect blend of rice to give you some different textures and flavors. I would like to try the Jasmati rice! I love Jasmine rice but have never tried this brand. https://twitter.com/JanJohnson1960/status/393998808511561728 - I tweeted here about the giveaway! I would like to make something with the Brown, Red and Wild Rice blend. I have used RiceSelect in the past but have never tried this blend. I want to try the couscous! My family enjoys rice and couscous! I would try the Royal Blend with Quinoa. And keep doing what you're doing! I love your blog! With a little luck...I will make this recipe today!!! It looks wonderful. oops!!! forgot to leave my email address, pamsterlady@hotmail.com and I would like to try the recipe asap!!! It looks wonderful and different. I have been using the Jasmati and Texmati rices for years. I don't believe the grocery store where I shop carries the Royal Blend. I'll try to get them to order it in. I looks deliciously interesting. Great recipe! I recently developed a recipe for a thin soft gluten-free wraps, and though I have been stuffing them grilled peppers and onion, and sometimes chicken, I cannot wait to add rice to the mix. When I make rice as a side dish I add several different ingredients. Adding butter and turmeric adds an Indian flair. I also make a tomato-free Spanish rice using chili powder and chicken broth. However, a traditional pilaf with beef consoume, onion, celery, and carrots is my fave! Rice Select Royal Blend, Whole Grain Texmati Brown & Wild Rice with Soft Wheat & Rye Berries is the one I want to try. I am trying to stay away from the plain white rice I grew up eating (Chinese mother) and have come to appreciate brown rice more than I would have thought possible. Plus I love rice salads, so versatile. I have a wonderful Quinoa salad recipe that this rice would be perfect to use as a substitute, especially the variety blend. Lots of veggies, like your recipe, great color, healthy and very tasty. Uses Bragg's Aminos, garlic and olive oil as the 'dressing'. Thanks for all your great recipes. I've been coming here and looking for a long time. Would love to try the RoyalBlend w quinoa. Love your blog! I'd love to try the Jasmine one, I'm a big fan of all things non-GMO!! I usually toss some brown rice into my mixed greens, but now I want to try this recipe! Yum! This recipe looks fabulous! Thanksgiving is getting closer and I have two vegetarians and one guest with a milk allergy coming. I would love to try a salad like this using the Royal Blend with Quinoa and seasonal veggies. Or maybe a dressing/stuffing. Thanks Susan, for the great recipes and the chance to win! aseasononthemountain at gmail dot com. I would love to try the Royal Blend - and I mix just about anything in my rice! I just recently bought Red & Wild Royal Blend with Flaxseed and Royal Blend with Quinoa! I can't wait to try it as a side :) I don't often use flaxseed because I don't have a grinder and I don't use the already-ground seeds fast enough to stay fresh. I would love to win since I love rice! I like making fried rice with egg, carrots, and peas. Some fish sauce and toasted sesame oil pulls it together and some wok seared chicken is my favorite addition. I'm going with the Royal Blend! Our family would like the Light Brown Rice with Flaxseed, great way to add fiber! I'd love to try the Rice Blend. I'd love to try the Royal Blend Texmati® White, Brown & Red Rice. RiceSelect Royal Blend® with Brown, Red, & Wild Rice and would put in my burritos or in my vegetarian enchiladas - yum! I would like to try the Royal Blend. I would try the Royal blend and mix is with raisins and apples in a wrap! I would love to try the their Royal Blend Whole Grain with Texmati Brown & Wild and I love to add peas to my rice dishes. I'd like to try Royal Blend® Texmati® Light Brown Rice with Quinoa and would mix vegetables and shrimp with it. yum! I would choose the RiceSelect Royal Blend® with Brown, Red, & Wild Rice and make it in mexican tortilla broth, and add corn and black beans. I'd like to try the Texmati with Flaxseed - thank you. I'd like to try the Royal Blend with Red Quinoa and I'd mix in freshly grated Parmesan cheese! They all sound good. I'd like to mix one with broccoli and cheese. I'd love to try the ROYAL BLEND TEXMATI WHITE, BROWN & RED. I think I could whip something pretty cool up with the Royal Blend looks great for my hubby and kids. I would like to try the RiceSelect Royal Blend with Flaxseed Rice. 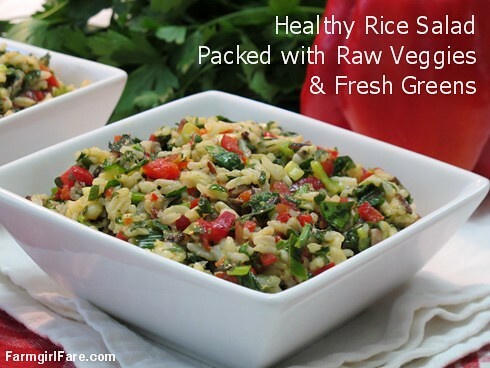 Yummmm, I would love to use Royal Blend with Brown, Red, & Wild Rice, and try your recipe: Healthy Rice Salad Packed with Raw Veggies and Fresh Greens. It looks scrumptious, and I already have a couple of ideas to personalize it, such as adding chopped portabella mushrooms to make it more of a main dish. Thanks! I would like to try the Royal Blend with quinoa. All the blends sound very interesting. I'd like to start with Royal Blend Whole Grain with Texmati Brown & Wild Rice. We use Texmati rice alot but I would like to try the Royal blend with Flaxseed. I would love to try the Royal Blend with quinoa--sounds like a great way to add in some protein. Your recipe sounds great, and I will be trying it soon. I love Jasmati, and would like to try the Royal Blend with quinoa! stephanie.lientz AT gmail DOT com. I would like to try the blend with flaxseed. My email is olivia41393@yahoo.com. I would love to try the flaxseed version! I have not tried any of the Rice Select rices before but appreciate sponsored posts such as this for introducing me to new products. So thanks for that. I'd like to try the Texmati with Flaxseed first. I like to mix chicken and rice together. I would love to try the RiceSelect Royal Blend Brown, Red and Wild. The Royal Blend with Red Quinoa would be my first choice.